This website and domain name are owned and operated by Ann Marina Harrison trading as Ann-Marina Beauty Makeup Lifestyle and described below as `Ann Marina`. By using this website and in consideration of Ann-Marina providing you with access to this website, you agree to the following Terms and Conditions, which governs your access to and use of this website. Ann-Marina reserves the right to amend these Terms and Conditions from time to time. The site is made up of content that includes but not limited to text, video, music, sound, graphics, photographs, illustrations, artwork, editorial materials, information, the design, layout, look, appearance, names, logos, trade marks, service marks and other material (content) which is protected by intellectual property laws (eg copyright, patents, and registered trade marks and designs), as well as and other legal rights and actions. You are not permitted to reproduce the documents, information or materials on the website for the purposes of sale or the use commercially or by any third party. The site includes content which Ann Marina owns or controls, as well as content which is owned or controlled by other parties, for which Ann Marina has a licence. You should not use Ann Marinas` trade marks or names without prior consent. if you become aware of unauthorised access to the site or use of the content which infringes any right, please send the information to Ann Marina. In particular you are not permitted to republish, upload, transmit electronically or otherwise or distribute any of the materials, documents or information that may be available for download from time to time on this website without Ann-Marinas express written consent of Ann-Marina with exceptions outlined in Copyright, Trademark and Restrictions Of Use below. Ann-Marina expressly reserves all copyright and trademark in all documents, information and materials on the website and reserves the right to take action against you if you breach any of these terms. You may not, except with Ann-Marinas express written permission, distribute or commercially exploit the content. Nor may you transmit it or store it in any other website or other form of electronic retrieval system. You must not link to, frame or mirror any part of the website without Ann Marinas` written authorisation. Trade marks used on this website to describe third parties and their products are trade marks of those third parties. Ann Marina expressly reserves all copyright and trademark in all documents, information and materials on her website and reserves the right to take action against you if you breach any of these terms. ii You may print or download to a local hard disk extracts for your personal and non-commercial use only. ;ii You may copy the content to individual third parties for their personal use, but only if you acknowledge the website as the source of the material. iii You may not, except with Ann Marinas` express written permission, distribute or commercially exploit the content. Nor may you transmit it or store it in any other website or other form of electronic retrieval system. If you are in the business of creating similar documents, goods or services for the purpose of providing them for a fee to users, whether they be business users or domestic users, then you are a competitor of Ann Marina. Ann Marina expressly excludes and does not permit you to use or access her website, to download any documents or information from her website or obtain any such documents or information through a third party. If you breach this term then Ann Marina will hold you fully responsible for any loss that may be sustained and further hold you accountable for all profits that you might make from such unpermitted and improper use. Ann Marina reserves the right to exclude and deny any person access to her website, services or information at her sole discretion. If you believe that a user has breached any of the above conditions, please contact Ann Marina. Ann Marina reserves the right to block or suspend any user of its website, and to modify or remove any material uploaded, posted, transmitted or otherwise made available on the website by any user, without notice. By uploading, transmitting, posting or otherwise making available any material via the website, you grant Ann Marina a non-exclusive, worldwide, royalty-free, perpetual licence to use, reproduce, edit and exploit the material in any form and for any purpose, and unconditionally waive all moral rights as defined by the Copyright Act 1968. Any material you send to Ann Marina on or via the website will be deemed to be non-confidential and non-proprietary. This includes any data, questions, comments, suggestions, ideas or other information. We will be entitled to use such material for any purpose without compensation to you. You agree to indemnify Ann Marina and each of the officers, employees, agents, contractors, suppliers and licensors (collectively Affiliates) of Ann Marina in respect of any liability, loss or damages (including all legal and other costs on a full indemnity basis) suffered or incurred by them arising (in whole or part) out of the breach of or failure to comply with any of these Terms and Conditions, or any other default or wrongful conduct in relation to the subject matter of these Terms and Conditions, on the part of you or any of your Affiliates. The views expressed on this site, in personally published ebooks. in lessons. on youtube or in any general comment are Ann-Marinas’ own and are provided for informational purposes only. Advertisers, commenters, and linked sites are solely responsible for their views and content – which do not necessarily represent the views of Ann-Marina. Any references to third party products, rates, or websites are subject to change without notice. Please do the appropriate research before participating in any third party offers. .By accessing Ann Marinas` website, you assume all risks associated with its use, including but not limited to the risk that your computer, software or data may be damaged by any virus transmitted by this website or by any Third Party Content or Third Party Website. To the extent permitted by law, all warranties, conditions and claims (whether express or implied) arising out of or in any way connected with this website are hereby excluded. Ann-Marina makes no warranties about the suitability of any product or treatment referenced or reviewed here and any reliance placed on these reviews or references by you is done so solely at your own risk. Ann-Marina is always happy to recommend products and this is a main part of the blog and YouTube. Any recommendations are based on Ann-Marinas' personal experience - or the trusted experience of a qualified esthetician and/or makeup artist or tester - but everyone's skin is different and something that works for one person may not necessarily work for another in the same way. The same with allergic reactions - it is impossible to anticipate allergies - it is pretty much possible for anyone to be allergic to anything. When in doubt do a small patch test as recommended by the manufacturer’s instructions and/or consult a licenced medical practitioner. Nothing on this site shall be construed as providing dermatological, medical or other such advice and you are always advised to seek the advice of a doctor, dermatologist or suitable professional should you have any such concerns. This website may be compensated by companies mentioned through advertising, affiliate links, or otherwise. Affiliate links means Ann Marina receives a commission if you click a link and purchase something that Ann Marina has recommended. 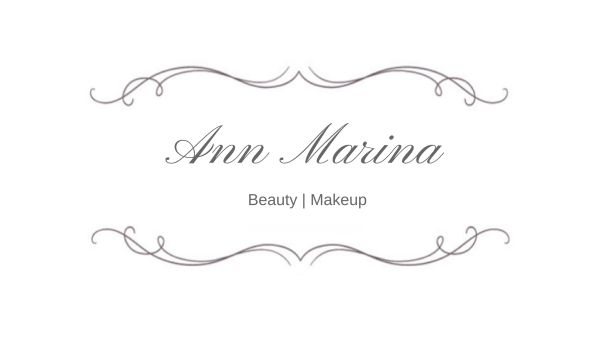 While clicking these links won't cost you any extra money, they will help Ann Marina keep this site up and running and keep the makeup lessons & tutorials. Thank you for your support! Ann-Marina takes your privacy seriously. This website does contain links to affiliate and other websites. Ann-Marina does not claim nor accept responsibility for any privacy policies, practices and/or procedures of other such websites. All users and/or visitors to this website have the option to discontinue receiving communication from Ann-Marina us and/or reserve the right to discontinue receiving communications by way of email, text message, DM, PM, or newsletters. To discontinue or unsubscribe please click on `unsubscribe` at the bottom of the newsletter or send an email stating you wish to be unsubscribed from the email list, text messages, DM or PM to [email protected]. No further emails or messages will be sent, Ann Marina doesn`t spam. If you wish to unsubscribe or opt-out from any third party websites, you must go to that specific website to unsubscribe and/or opt-out. AnnMarina.com will take reasonable technical and organisational precautions to prevent the loss, misuse or alteration of your personal information. By the use of this website, you are hereby accepting the terms and conditions stipulated. If you are not in agreement with these terms and conditions, then you should refrain from further use of this site. In addition, your continued use of this website, following the posting of any updates or changes to the terms and conditions shall mean that you are in agreement and acceptance of such changes. if any part of these terms is determined to be invalid by any court having jurisdiction, that invalidity does not affect the validity of the remaining parts, which remain effective. if Ann Marina doesn`t enforce or act on a part of the terms, she isn`t waiving her right to do so later. These terms are the entire agreement between Ann Marina about the site and content. they supersede any prior understanding or agreements (written or oral). The terms are governed by the laws of Western Australia, Australia and you agree that the courts ofWestern Australia, Australia have exclusive jurisdiction over them. Ann-Marina may update these Terms and Conditions by posting a new version on this website. You should check this page occasionally to ensure you are familiar with any changes.